February is Library Lovers’ Month, and today I want to pay tribute to libraries I have loved and sing the praises of an institution that has made my life infinitely better. The first library I remember is the Pasadena Public Library where I went with my mother and on field trips as a child. Once I remember laughing uncontrollably (but quietly) with my best friend, Julie, when we happened upon the name Wyatt Earp in a book—the name struck us as being hysterically funny. When I wasn’t laughing at names, I was earnestly checking out books from the children’s section, coming home with as many as I could carry. As an adult working for a magazine for teenagers, I also used the Pasadena library for books to use as references or to fact check articles I was editing. Oh, the days before the Internet! 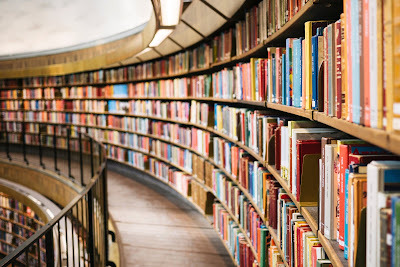 In addition to lending books and other media, most public libraries also host educational programs, serve as polling places on Election Day, and provide many more community services. “At the core of public library service is the belief in free access to information—that no one should be denied information because he or she cannot afford the cost of a book, a periodical, a Web site or access to information in any of its various formats,” according to ilovelibraries.org. The library is one of my happy places, and I want to spend more time there this year. I’ve gotten into the habit of placing holds on books, then just running in and picking them up. On a good day, I’ll spend a few extra minutes in the library bookstore. I miss soaking in the library’s (to me) peaceful-yet-exciting atmosphere. Perhaps I’m due for an afternoon spent wandering the aisles and exploring the shelves—a true simple pleasure. If you haven’t been to the library recently, why not pay it a visit? Do you have any favorite memories of libraries? Kathy hats off to this post. The library is certainly one of my most happiest places. Hubby and I often spend a quiet Sat. afternoon either at one library or another. What a blessing to have such a rich resource. When I was growing up - in the summer Mom would take us every two weeks and we would check out bunches of books for those hot lazy afternoons. Hope you get that afternoon soon to browse those aisles. Have a lovely day. Hugs! Debbie--So nice that you share your love of libraries with your husband. I am truly grateful for all the library has meant to me over the years, and hope libraries will remain free and open forever. Yes, memories of libraries, Kathy, but too many and deep to share in this little note. I loved them so much that I ended up working in them...I still do art workshops and have art shows in libraries. It does go back to childhood, and my library in my teen years was incredibly important in my life.